The primary purpose of mobile app development is to offer something out of the box and which is useful. However, the value of a mobile product should be matched with the constraints of the project. All the efforts and cost put into the development of the mobile app will be a total loss if the primary purpose of the mobile app project is not conveyed. In this situation, the requirements will be lost in translation, and the end product will be entirely different from what you have assumed it to be. Balancing the act of a fantastic product idea depends on the Product Requirements Document (PRD). Top mobile app development companies recommend this for successful project completion. A PRD is kind of a wireframe for the entire mobile app, and it plays an essential role in communicating the business logic, its technical requirement and the user workflow. PRD makes sure that the vision of your project and the end outcome is the same without any deviations in the concept of the project. In the initial stage, there might be a possibility that the product vision looks uncertain. Whereas working through a PDA pressurizes you to think about every scenario and aspect of the product. This scenario is the key priority area that needs more attention and determines what project constraints might hamper the deliverables like scope, time and budget. How to Manage Business Requirement Constraints? A PRD makes you think strategically about the business requirements. This process gives an idea to all the stakeholders including you about what to expect and what organizational objectives can be achieved with the help of the mobile app. The essential objectives of a mobile app development project should be whether or not it will streamline your current business process or help you with the new one. If your business aims to implement an entirely new business process, then timeframe becomes a significant factor as it determines what is achievable through the development process. One should determine the importance of some features which are expected to make the process fully functional without any interruption and will you be able to implement those features in a set timeframe? As the PRD aims to make you think from all the angles, you will gain more insight and determine the fact that what is possible within the desired timeframe and budget. How to Manage Technical Requirement Constraints? One can leverage a PRD for making strategic choices regarding the technical requirements. The critical segments of the development process, i.e. the platform, hosting or back-end database design may hamper the workability if it is not given timely attention or monitored on a regular basis. The backend is the backbone of your mobile app, and hence it is vital to give up to date knowledge to your product team so that they can transform your idea into a fully functional product within a fixed timeframe. Mobile app architecture is very authoritative for managing product development constraints. Hence the architecture structuring of a mobile app is essential as it strategically conveys, negotiates and communicates between all the stakeholders. A robust architecture can accommodate desired changes, and by planning technical requirements properly, your app development team can design a structure that takes care of the budget constraints effectively. There are often constraints on a given project which means that one will have to compromise on certain things. Hence teams should determine the things conclusively and try to settle down as much as possible. This doesn’t mean that the ultimate product quality will be compromised and an inferior product will be built. However, it becomes vital to agree to a specific set of decisions that need to be made in case of unavoidable circumstances. While making product decision or development changes one needs to ask a few before moving forward. This will help you determine the reason behind compromising a few things at the development stage. Is it required to compromise on features that will take just a couple of hours to build or is it needed to go with features that will take only a few weeks to make? What is the purpose of going with different features? You will have to determine the roles of specific features and their importance within the entire app. It will also need to find out what implications will the app face without particular features. The question has to be answered - does that specific feature will add value to your mobile app? Top app development companies are well versed with these phases of development; hence, they are experts in seeking out an alternative so that the workability of the app does not get affected. This means the functionality requirement will be addressed but with an option or a choice that takes lesser time to develop. In the end, you will have to figure out the effectiveness of implementing the alternative method. Many apps in the market are created without proper planning, and though a humongous amount is being spent in the same, the app turns to be a total failure. PRD is a great way where right from the planning stage your product is being saved from getting affected because of the constraints and your product quickly rolls out in the market. Compromising in the development stage cannot be ignored as there may appear many constraints. However, a lot of these complexities can be eliminated right at the planning stage by documenting everything and making the entire process simpler at a later stage. 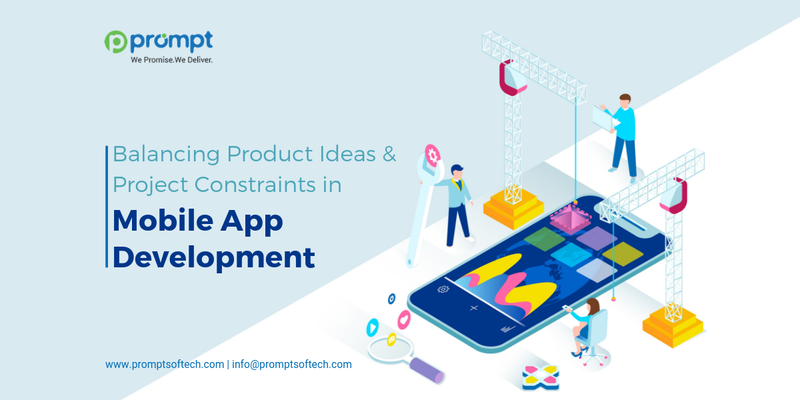 At Prompt Softech, we have top mobile app developers in India who are specialists in building user-centric mobile applications spanning a broad array of industries. We develop applications across all the essential mobile platforms to optimize extensive audience coverage.